New replacement DELUXE 1969 Camaro rear seat covers. These are deluxe with vinyl and houndstooth cloth insert. 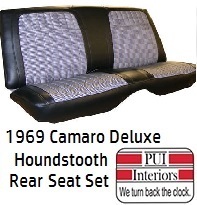 New replacement vinyl deluxe covers from PUI offer superior quality and fit for your early first generation 1969 Camaro with all style rear seats. Seat covers are available in 3 stock factory matching colors. Use the drop down menu to select color desired.